Thank you very much for commenting. I would have loved to have expanded my travels to the places you speak of. You must be having very strong feelings about what is happening in Syria after having visited their cities and seen them for yourself and gotten to know the people. I’m so pleased you had occasion to travel there. It certainly does change one. oh yes–I do understand–thank you, I see now. Great painting! I too was able to visit Isreal, in 2009. Having some Jewish heritage and being a Christan, the visit was life altering, esp. my visit to the Western Wall. Thanks for sharing this! can you explain this a bit more? how does it? Hello! Thank you for these encouraging words! This is a juried show to be held mid-April, and I submit my entries next week and will find out mid-March if I made the cut. It is a show held in our city in our historic Courthouse, but is open to Federation Artists across Canada. Lots of competition! Thank you for asking about it. This portrait is so inviting..like many of your other works. I feel like I could have a long conversation with him about his culture and views Where is your show? that is just such a lovely comment. thank you very very much for your kind words. thank you Kerry–and yes, it is true the first Intifada began in the late ’80’s. I went in January of ’89, and though tense, there was nothing overt happening to impede our travelling about. And so we visited Ramallah and the West Bank and other places which today might not be easily accessible. However, only a few months later–in July–the tensions did erupt and I remember being thankful I went when I did. Thank you for helping me clarify ‘the current unrest had not yet erupted’. Wasn’t 1989 smack in the middle of the first intifada? I appreciate hearing your story of your Rabbinical friend, and your affinity for this hallowed place–and thank you Selma, for your comments regarding this painting. I am enjoying your site and how you place a great deal of value on people’s everyday stories. I would love to visit the Western Wall. I think it would be a parrticularly moving experience. Your painting is inspiring. There is such wisdom and clarity in the eyes of your subject. I used to know a rabbi in Bondi who looked very much like the man in your painting. I’m not Jewish but he took the time to talk to me whenever we met ( I lived near the synagogue.) I will never forget how at peace he was with the world. Thank you for reminding me of him! I really hope someday you can. Thank you for the visit. I am enjoying your posts, too. Beautiful… I’d love to visit the wall in this lifetime. How very sweet and kind of you, JoDee. It is a pensive and many-layered site, located at the crossroads of many cultures and traditions. It has its impact on all who visit it. Thank you so much. No matter, Lance, I have it in my head. That’s even better. My Estate would never understand, would they? It sold quite soon after it was hung, something I should have thought to have said up front. In my heart, though, it’s now been bought by yours, which is far more meaningful. I wish it were still available. Ah, Lance…you of the voice and the images. I want that painting. Do you believe in your heart that I could live with it? Now it’s my turn to say, ‘wow’. You sure have a way with words–such a gift. WOW, that’s what it is about the painting that makes me feel a little discomfort. He old man’s countenance is complicated. His almost cheery cheeks and eyes are deceptively welcoming. The intruder gets to the mouth and realizes he’s interrupted something. The mouth does not form a polite question. It tells us that we have come uninvited, but we will be tolerated because the Wall must be shared…even with the unholiest of us. You said perfectly: We are suddenly “challenged to either start praying for our own souls or at least stop staring”. That’s precisely how I feel when I look at that painting. I just couldn’t quite put my finger on the strong emotional impact of it on me. I suppose I didn’t want to define it. It is impossible for me to forget this image. Thank you Saroja for your insights and appreciation and keen observation. Yes, you would know firsthand about the tight border along Jordon. These days there are tight borders along most countries, and we live in heightened times. Very thoughtful of you. In a former existence I had to study Hebrew for 3 years (seminary), and discovered it is not a subtle language–not a lot of ambiguity. It’s either yes or no–belief or no belief–male or female. In one way it’s off-putting—in another, it’s refreshing. My visit to Israel was somewhat like that, for everyone has been through enough that they are direct, and no-nonsense. The Western Wall epitomizes this. There aren’t many places on earth where one is allowed to be an observer of such public, stripped-bare supplication. In this painting, the observers (i.e. us)–not exactly welcome, not exactly unwelcome–are nonetheless challenged to either start praying for our own souls, or at least stop staring. Thus, it is meant to impart a degree of respectful discomfort–especially for any buyer who deigns to hang it in the living room. Thank you for asking more, (as is your delightful nature). Lance, this is not sentimental. Most images of The Wall are. I’ve been thinking of how to describe it. I can’t. It’s just different. And it sticks in my head. 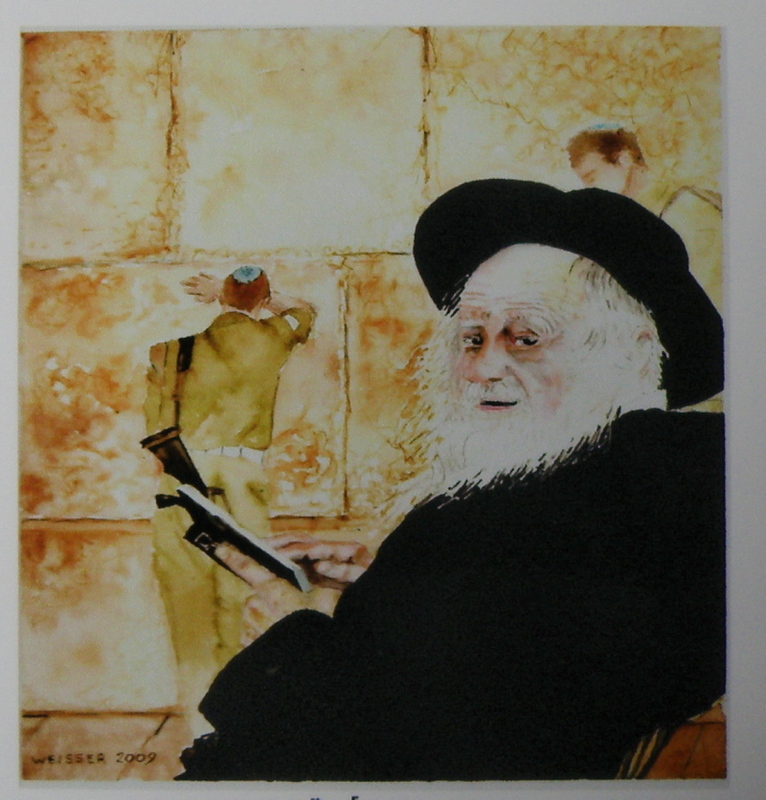 I keep wondering why you painted the rabbi, or whoever he is, the way you did. This is a very different take on that subject. I keep coming back to look at him again. Why do I do that? Your post on laughter brings a smile–you’re very self-effacing, and must give a lift to all those around you. Thank you again for being so effusive and supportive. omg, they are SUPER!! holy–I didn’t scroll down far enough. wow. These are just . . . . jeez, I was going to say, ‘right up my alley’. THANK YOU for posting these! Thankee much! I managed to get some alleyway shots of Church Hill, incidentally. Not sure if any are really usable, but I’ll probably be primarily doing night/urban stuff til spring, so there’ll be more. Am in San Jose del Cabo on the Baha. Went to “art walk” last night. Will be doing a post soon on that! Oh thank you again, Jane. You are such a cheerleader and promoter of the Arts! I hope you are enjoying the Galleries in Florida these days, and making some happy ‘finds’! I appreciate all your encouragement, Megs–and it is worth my pointing out that this is not what they call a ‘one man show’. I’m not in that league. It is a juried show whereby submissions by various artists are gone over and accepted or rejected. So I will need your very best wishes when I submit my 3 entries, hoping that at least one of them will make the cut! Thank you, Michelle! Wow, did you ever make a beautiful photograph of that huge moon a week or so ago. It is something to see! Thank you very very much, Cara! You write so well, and have much to share with your readers. An incredible experience it must have been traveling to Israel, seeing the sights that most of us only read about or make do with pictures. And then, of course, there is literally walking in the likes of some the most notoriously heroic footsteps ever taken. Amazing. This painting is wonderful Often times I have a hard time “getting” paintings where expressions have been manufactured. It’s not easy to capture one’s likeness. While I have no way of knowing for certain, I think this Rabbi, both impish and sacrosanct was well limned. Thank you for sharing a bit of your story. Beautiful painting, I love his face. I’ve always wanted to visit that region, so much history. What a wonderful portrait Lance! The character of the face tells a story in itself. I can almost hear his voice speaking to you. Anymore portraits to come? Would love to see them. I appreciate all your comments to me. Thank you for this one! How very kind of you. I am enjoying your Northern photos so much. I appreciate it very much, Adam. I just love the trees in your latest post! Oh thank you for that comment, TBM! Means alot. Oh Celeste, I do hope you can go someday. And yes, there is something elemental. It is the gathering place of so much of civilization. And the wildflowers! You wouldn’t believe the variety on the hillsides. Thank you Mags–thank you for commenting so highly on this picture. I’ve been behind in my visits to you! I’m trying to get ready for a show in April. I enjoy your posts. They give me a lift. You are always so sweet to me, Nia. Coming from you, that is very meaningful for me. I do hope, Boyd, that you have that opportunity! Egypt would be another amazing journey. Thank you so much. Beautiful and amazing portrait. I would love to travel to Israel one day myself. I used to buy art from artists from Jerusalem but I have not seen them in quite some time. A beautiful painting. You really caught the feeling of the place. How lucky that you went to these places before the unrest, no doubt a wonderful experience. It is a hearts desire of mine to visit the beloved holy land…what an emotional experience that would be for me, and how blessed you are to have been. I love the way he is looking over his shoulder, like he is inviting me in and reminding me of the importance of the place. This is a wonderful painting with so much emotion and depth. One man with his back to us, in deep prayer, and the other looking directly at us with his own story to tell. Really beautiful work and I enjoyed reading your story that accompanied it. thank you so very much, rhondablue. thank you for taking the time and giving me this assessment. What an awesome opportunity to be able to travel so freely. I love the portrait and the way he’s looking back over his shoulder at you.